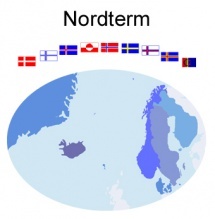 Nordterm is an association of organisations and societies in the Nordic countries which are engaged in terminology work, training and research. On our web pages you can read about the Nordterm organisation, its background, publications, seminars and courses as well as projects. You can find information on all kind of terminological activities in the Nordic countries. There are links to such electronic glossaries that contain at least one Nordic language, and also information on e.g. research reports, courses, literature, projects, terminology tools and organisations. This page was last modified on 20 April 2017, at 10:23.